Up to 2-3/4 inches long; black with white and yellow bands. Wingspan 3-1/2 to four inches long; wings brownishorange; black to dark brown veins; two rows of orange and/or white spots. Found primarily in meadows, roadsides and sandy areas where milkweeds grow. 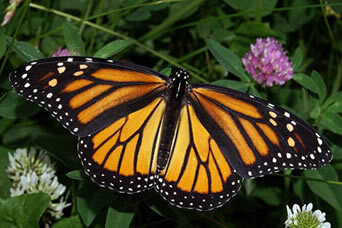 Caterpillars feed on milkweed foliage, flower buds and milky juice; butterflies feed on flowers. Females lay eggs along migration northward; fully grown caterpillar changes to barrel-shaped, leaf-green pupa with gold dots; process from egg to butterfly takes about four weeks. Butterflies are capable of flying 2,000 miles during southern migration each autumn, often stopping in same rest spots every year. About 1/4 inch long; light gray with four lengthwise stripes on thorax; large reddish compound eyes. 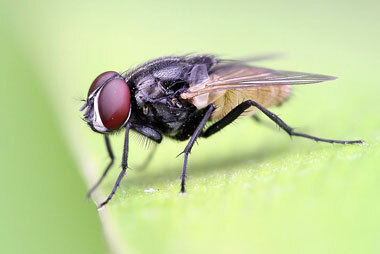 May migrate up to 20 miles from birthplace, but most stay within one or two miles; 98% of flies caught in houses are house flies. Feed on a wide variety of foods, but prefer liquids containing sweet or decaying material; larvae feed on moist food rich in organic matter. Eggs laid singly, but in clusters of 75-150; female may lay over 500 eggs in a lifetime; eggs hatch in 10-24 hours; entire life cycle completed in less than seven days. Associated with a number of filth-related diseases. 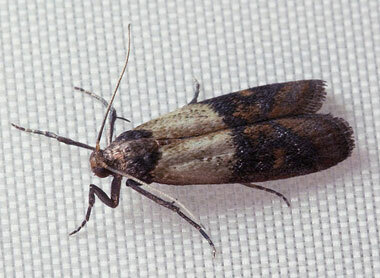 1/4 inch long; shiny black to tan with yellowish-white lines; orange head; wings have black F-shaped bands. Found primarily in orchards and the edges of deciduous woods with native hawthorns, blueberry bushes or western snowberries. 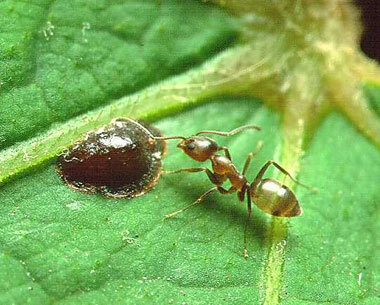 Adults feed on leaves and fruit; larvae feed on pulp of fruit. Eggs inserted singly into fruit skin; fully grown larvae tunnel out, drop to the ground and pupate in the soil. Males perform courtship dances, waving their wings while females watch. 1/2 inch long; blackish-brown with dull edges on sides and down middle; above head is rosy pink covering with dull yellow edges and black spot in center. Nocturnal; live in moist places under debris, bark or decaying matter on the ground; on summer nights, blink their yellow lights to attract mates. Adults do not feed; larvae feed on insect larvae, slugs and snails. Eggs are left on damp soil; larvae overwinter, then pupate in moist soil. 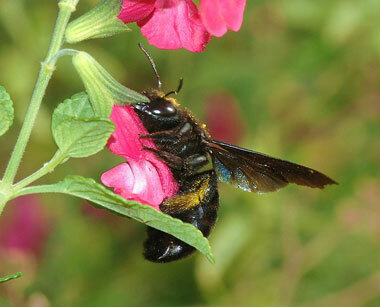 Up to 5/8 inch long; reddish-brown and black with paler, orange-yellow rings on abdomen; two pairs of wings. Very social; hive in hollow trees and in hives kept by beekeepers; pollinate crops and produce honey. Adults drink nectar and eat honey. Queen lays eggs at intervals, producing colonies of 60,000 to 80,000 members; life span is usually two to three years for the queen; drones die after mating. Workers have a stinger that is used when colony is threatened; members of hive pass food to one another mixed with saliva to form a chemical bond. Large, about one inch, resemble bumblebees; some species may have a blue-black, green or purple metallic sheen; no hair on abdomen. Often burrow into the exposed, unfinished dry wood of buildings, telephone poles, fence posts and bridges; prefer softer woods for nesting; not social insects, although individuals may establish burrows close to each other. 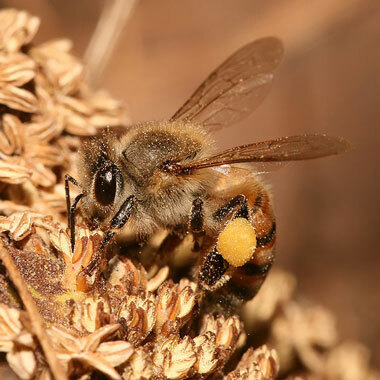 Complete one generation per year in most of the U.S.; mature from egg to adult in 84 to 99 days; female furnishes nest with “bee bread,” a mixture of pollen and regurgitated nectar, and lays an egg on top of it. Males do not sting, but females have a potent sting which they rarely use; make loud buzzing noise when flying. Variety of shapes and colors; can be distinguished from bees by their smooth, rather than hairy, bodies; 1/2 inch to 3/4 inch long. Exhibit predatory and scavenging behavior; some species are solitary, while others live in colonies which may number thousands of individuals. Primarily protein such as spiders and soft-bodied insects, and small animals. 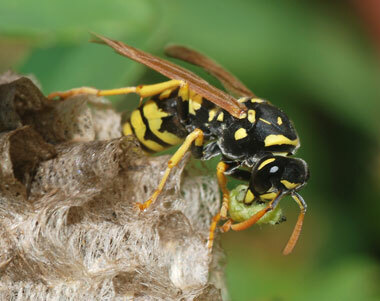 Social wasps begin a nest with one queen laying all eggs for colony; if a queen dies, a worker can take over egg-laying function until colony produces new queen. Very protective of their nests; will defend against invaders with painful stings. 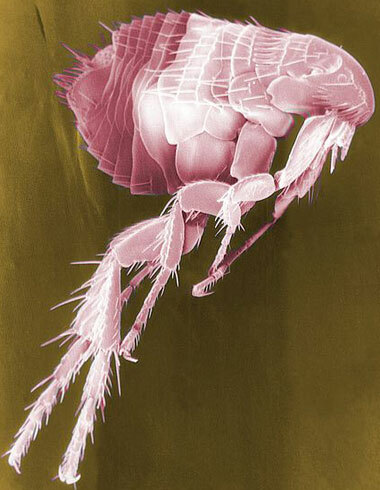 Most species of concern to man have yellow and black coloring; 7/16 to 5/8 inch long; appear to have hairy bodies. Live in colonies of from 20,000 to 80,000 individuals; will leave humans alone if not provoked. Only one egg-laying queen in a hive; queen may live as long as five years and lay as many as 1500 to 2000 eggs per day; worker females protect eggs and the young; drones’ only duty is to mate with queen, after which they die. Stings can be painful, but are harmless to most people. About 1/8 to 1/4 inch long; brown to dark brown with light stripe down center; wings have dark brown scales. Often found near shallow temporary pools; larvae live in quiet bodies of water, ranging from fluid-filled leaves to stagnant ponds and lakes. Males drink plant juices; females feed on blood of mammals, including humans. Eggs are dropped in temporary pools; larvae feed, pupate and emerge over an extended period. Population increases after summer rains; males do not bite. 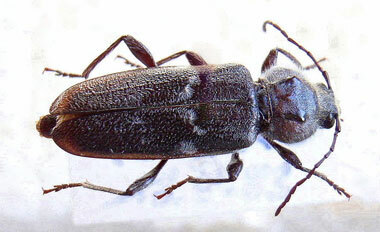 About 1-1/4 inches long; male has violet abdomen and black head and thorax; female is dark brown to black; clear wings. Found along slow streams, shallow weedy lakes or coves of large rivers; alight on grasses and plant stems. Feed on small, soft-bodied insects. 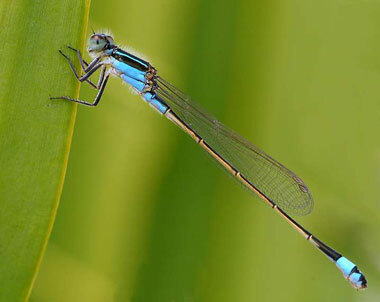 OTHER INFORMATION: Often seen flying in tandem over streams and ponds. 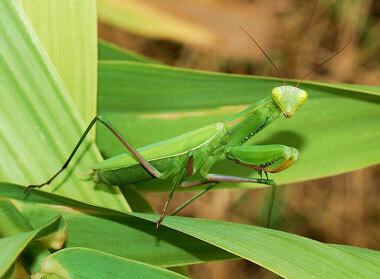 About 2-1/2 inches long; green to tan; wings extend beyond abdominal tip; large brownish compound eyes. Found primarily in meadows, on foliage and flowers. A variety of insects, especially caterpillars, flies, butterflies, bees and moths. Females lay hundreds of eggs in large oval masses; nymphs are dispersed by wind or eat one another. Female often devours the male while mating. 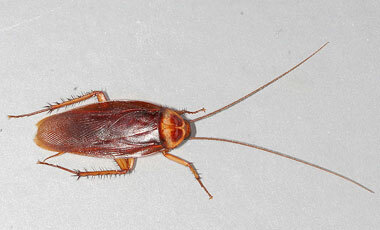 The largest of the common cockroach species, about 1-1/2 inches long; reddish-brown wings with light markings on thorax. Very aggressive; prefer warm, damp areas; more likely to be seen in daytime and outdoors than other species; fly more readily than other species. Scavengers; feed on a variety of foods; prefer decaying organic matter. Female needs to mate only once to produce many egg capsules; each capsule contains an average of 13 eggs; nymphs molt 13 times, in about 600 days, before reaching maturity; can live up to 15 months. Have shown a marked attraction to alcoholic beverages, especially beer; also known as the water bug. Dark brown, up to 1-1/2 inches long. Prefer to live outdoors; populations are relatively immobile compared to other species. Scavengers; normally feed on plant material, but can feed on a variety of foods. Egg capsules hatch in 24 to 70 days; each contains an average of 20 eggs; females reach maturity in 320 days and produce an average of seven capsules; adults can live up to 200 days. 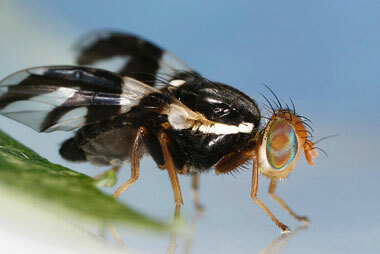 Particularly numerous in southeastern U.S.; fly towards lights at night. About 5/8 inches long; light to medium brown, with two dark longitudinal streaks on the thorax. 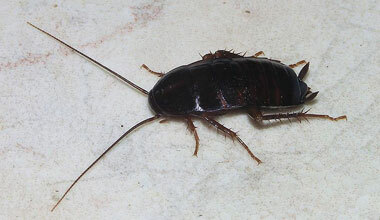 Nocturnal; most common urban cockroach; often found around buildings; can be found outdoors during warm months. General feeder; particularly attracted to fermented food. Females produce one egg capsule every 20 to 25 days; each capsule contains from 18 to 48 eggs; newly born become adults in as little as 36 days; adults can live up to one year. 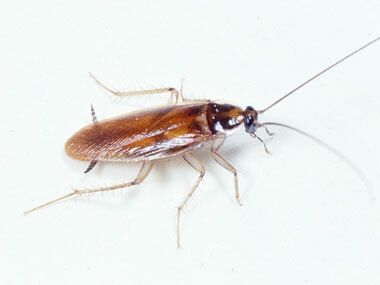 Often found aboard ships; widest distribution of all roaches in U.S. Dark brown, about one inch long. Common outdoors; tend to live near the ground and in warm, damp areas; most often found indoors in high moisture areas, particularly basements and ground-floor storage areas. Scavengers; often eat decaying organic matter; prefer starches if available. Egg capsules contain 16 eggs; female will produce an average of eight capsules; nymphs go through seven molts before becoming adult, in about a year; adults can live up to 180 days. other species; give off distinctive unpleasant odor. About 5/8 inch long; wings have two brownish-yellow bands. Nocturnal; can fly; may be found throughout any structure, but prefer dry, warm areas, high locations, and inside furniture. Scavengers; eat a variety of foods, but prefer starches. Female carries egg capsule for 24 to 36 hours, then attaches it underneath or on the side of a protected surface; capsules contain an average of 18 eggs; nymphs reach maturity in an average of 161 days; adults live up to 10 months. 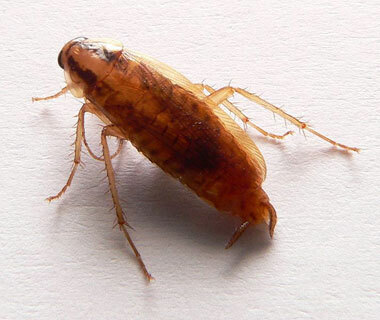 Sometimes confused with German cockroach; frequently transported in furniture; not as dependent on moisture as other species. 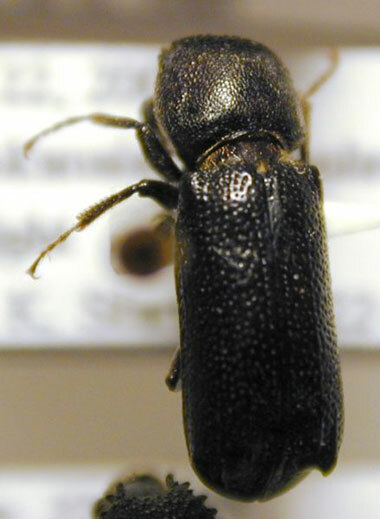 Among from 1/4 to 3/8 inch long; most common species is black, but some have reddish or yellowish coloration; workers have large mandibles. Normally nest in dead or water-damaged portions of standing trees, stumps or logs, or burrow under fallen logs or stones; nests look like hollow “galleries” in wood; may move into buildings in search of food; foraging ants will travel up to 100 yards from nest to look for food. Do not eat wood; feed on a variety of both plant and animal food; prefer sweets and meats; also feed on other insects. Queen lays 15 to 20 eggs the first year, and up to 30 eggs the second year; eggs complete their life cycle in about 60 days; worker ants can live up to seven years, while a queen may live up to 25 years. Hollow “galleries” in nests are so smooth, they appear to be sandpapered; colonies can contain up to 3,000 workers, but usually have only one egg-laying queen per colony. Reddish, about 1/4 inch long. 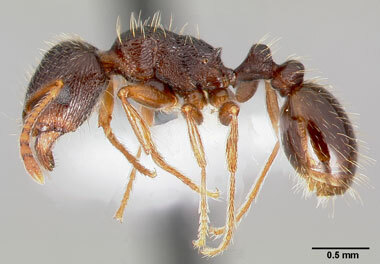 Nests in mounds of one to two feet in diameter, and about 1-1/2 feet high; large colonies can have up to 250,000 workers; very active and aggressive; will sting any intruding animal repeatedly. Omnivorous; known to eat meats, greasy and sweet materials. Has been known to remove rubber insulation from telephone wires; sting is painful, and can kill young wildlife and domestic animals. Dark reddish-brown to black, 1/10 inch long; antennae have 12 segments. Nests found in a great variety of situations, both indoors and outdoors; nests are usually shallow and found beneath a stone or behind a board or wall; travel in trails; forage day and night. Honeydew, in the wild; inside, prefer sweet items. Each female in the nest lays only one egg a day; young reach adulthood in an average of 24 days; workers and females live for several years. 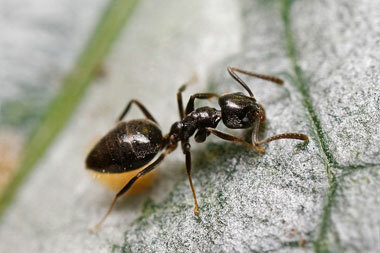 When crushed, give off very unpleasant odor; colonies are very large, but can be driven away by invading Argentine ants. From light to dark brown, about 1/10 inch long; antenna has 12 segments. Readily adaptable and can nest in a great variety of situations; colonies are massive, and may contain hundreds of queens; nests are usually located in moist soil, next to or under buildings, along sidewalks or beneath boards; travel in trails; forage day and night. Eat a wide variety of foods, particularly sweets. Eggs are white, laid in summer; larvae emerge after about 28 days; adult stage reached in about 74 days. Have no important natural enemy in the United States. Very small; light yellow to red, with black markings on abdomen; about 1/16 inch long. Require a warm temperature to survive; will nest in any well-protected or hidden area; nests are very difficult to find because ants stray far from them, usually over established trails. Feed on a diverse array of material, including sugars, greasy foods and proteins; will also eat dead insects. 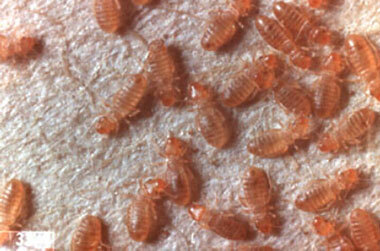 Egg to adult in about 45 days; females live up to 39 weeks and lay about 400 eggs; workers only live up to 10 weeks. Mature forms have wings, but do not fly; very large colonies, with up to several million workers and thousands of queens; when the colony is stressed, it splits and scatters into sub-colonies in a process known as “budding". Light brown to black, appendages lighter than the rest of the body; about 1/10 inch long; parallel lines on head and thorax; antennae have 12 segments. Sometimes enters buildings foraging for food; nests are outdoors under stones, along curbing or in cracks of pavement; can nest indoors in walls and under floors. Eat a variety of foods; prefer sugars but require protein for reproduction. Queen produces five to 20 eggs per day; brood develops in about 40 days; young go through three larval stages. 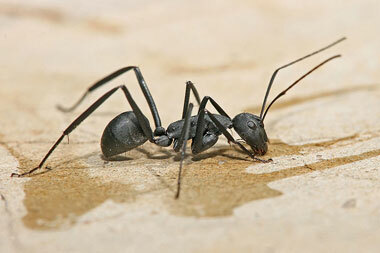 Slow-moving; often live in nests of larger ants, where they feed on the larvae of the host. 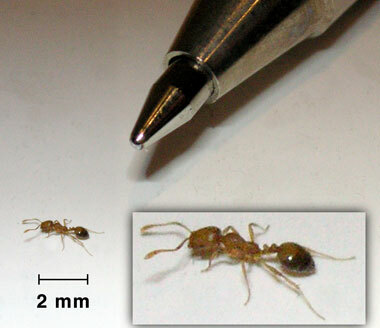 One of the smallest household ants, about 1/32 to 1/16 inch long; antennae have 10 segments; range in color from yellowish to brown. Nests occur in a great variety of locations outside the home, especially under rocks; may nest indoors in cracks and cupboards. 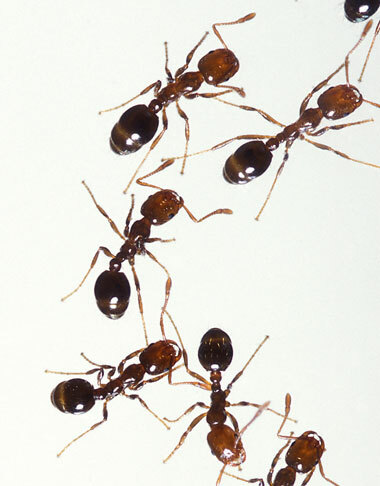 Feed on immature forms of other ants and insects; also attracted to greasy or high protein foods such as cheese and animal matter. So small they are difficult to detect. 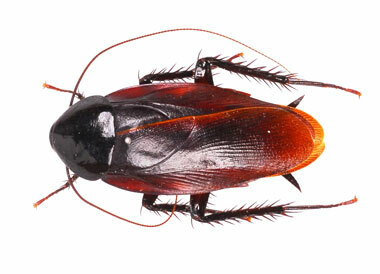 Reddish-brown to black, about 1/8 to 1/4 inch; elongated and slender. 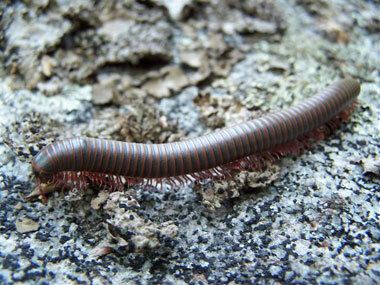 Females bore into wood and create tunnels for laying eggs; feeds on both softwoods and hardwoods. Usually new wood, less than 10 years old. Eggs are laid inside tunnels; larvae complete their development usually in about one year, but have been known to take up to five. 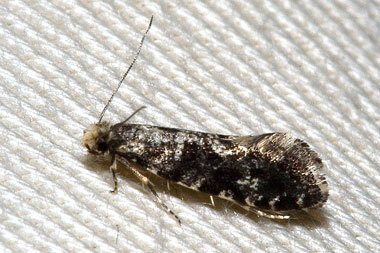 Often found in oak firewood, and in furniture. Adults are small, slender and flattened, reddish-brown to black; from 1/8 inch to 1/4 inch; short antennae; larvae are usually less than 1/4 inch long, cream colored and slightly C-shaped. Attack the sapwood of hardwoods, especially oak, hickory and ash; create small, round holes which appear in hardwood floors, furniture, molding and fixtures. Starch, sugar and protein in the sapwood of hardwoods; prefer moisture content of between 10 and 20 percent. Life cycle averages one year, with the majority of time spent in the destructive larval stage; females lay an average of 20 to 50 eggs. 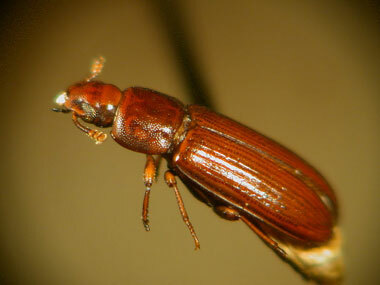 Most common of the wood-boring beetles in the U.S; larvae reduce timber to a mass of very fine, powder-like material. Adults are black to brownishblack, about 5/8 to one inch long; slightly flattened; wing covers are usually completely black, but may have distinct white markings. Larval stage feeds on seasoned timber for two to 10 years before becoming an adult beetle; adult emerges from infested wood, leaving 1/4 inch oval exit hole, and mates, living only 10 to 15 days. Larval stage feeds on wood with moisture content of between 10 and 20 percent; prefers softwoods. Life cycle averages three to five years, but can take as long as 12 years, depending on environmental and nutritional conditions, with the majority of time spent in the destructive larval stage. Contrary to its name, it occurs mostly in houses less than 10 years old. Dark brown to blackish-brown, about 1/8 to 1/4 inch; range in shape from slender and elongated to oval. Larvae live in and create tunnels in hardwoods and softwoods, usually more than 10 years old; create small, round holes of 1/16 to 1/8 inch diameter, which appear especially in structural timbers. Larvae feed on both hardwoods and softwoods. Life cycle averages two to three years, with the majority of time spent in the destructive larval stage; females lay about 50 eggs. 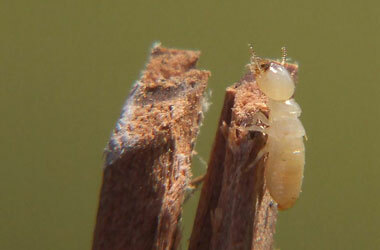 Unlike termites, some anobiids are able to digest wood without the aid of protozoa, and can live on a diet of cellulose. 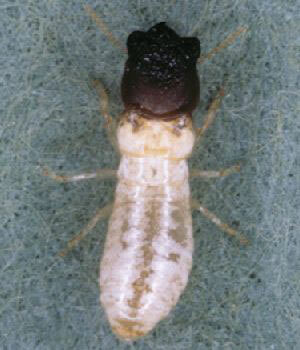 Flattened, oblong and reddish-brown; about 1/7 inch long; larvae are 1/4 inch long and are white to yellow. Nest in stored grain and grain products; small size enables them to work themselves into many sealed containers. Feed on a variety of foods, but most commonly flour and cereal products. Females lay an average of 300 to 400 eggs; life cycle usually takes about seven weeks, but may last up to three months; four or five generations per year. Attracted to light, but quickly run for cover when disturbed; adults may live as long as three years; impart a disagreeable odor and taste when found in flour. 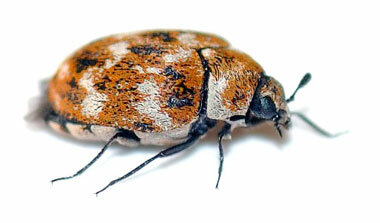 Small, rounded, gray to blackish, with a varied pattern of whitish and orange scales on the back; shape resembles the ladybug; about 1/5 inch long. 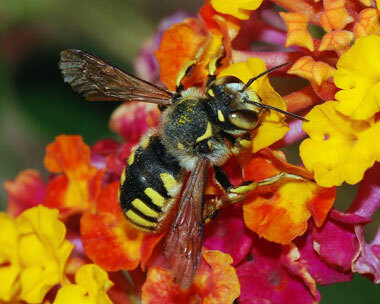 Adults often inhabit flowerbeds; can enter the home when cut flowers are brought in; outside, feeds on pollen and nectar. Feed on keratin-based foods; eat a variety of dead animal materials, fur, hides, feathers, silks and woolen items. Female lays 30 to 100 eggs, which hatch in 10 to 18 days; larval stage lasts 60-325 days; adults live 20 to 60 days. These beetles have a complete metamorphosis, with the larvae being the only stage that causes damage to fabrics; some species have hair tufts that can be irritating to the skin, or if breathed into the nose or lungs. Up to 3/8 inch long; round body; bright red or yellow, with black, red, white or yellow spots. Found in meadows, fields, gardens and forests. Feed primarily on aphids and other small insects. Clusters of bright, yellow eggs are attached to foliage near food supply; female may lay up to 500 eggs during a lifetime; life span of a few months. 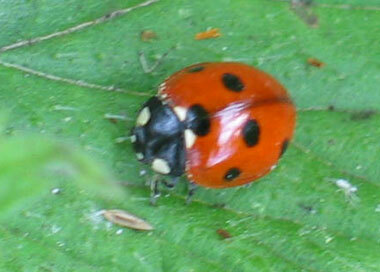 Have been used to control insects which eat fruit crops; seek warmth of buildings in autumn. Four “castes” of a termite colony: 1. worker: approximately 1/4 inch long, light colored, wingless; 2. soldier: elongated head with mandibles; 3. supplementary reproductives: wingless or very short, non-functional wings; light colored; 4. primary reproductives: winged, and darker than other members; caste most often seen by homeowners. Live in colonies underground; able to reach food above the level of the ground by building mud tubes; dependent on moisture for survival. Wood and other cellulose material; harbor one-celled organisms in their digestive tracts to help them digest cellulose. Different rates of growth from egg stage to adult depend on individual species; one queen per colony, which can lay tens of thousands of eggs in her lifetime; most eggs are laid by supplementary reproductives in an established colony. 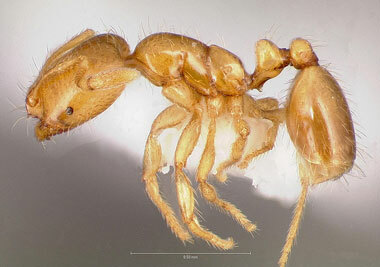 Larger than subterranean termites, up to 1/2 inch long; no worker caste in the colony. Nymphs pass through seven stages before reaching adulthood; sexual forms eventually swarm to form new colony. Wood damage is different than that of other termites; these termites cut across the grain of the wood, excavating large chambers which are connected by small tunnels; colonies may contain up to 2700 members. 3/4 to 1 inch long, light yellowish-brown, with three darker brown bands on the head. Nocturnal; live outdoors, but may be found indoors in warm areas, particularly the kitchen, basement, fireplace, or in cracks; make a distinctive chirping sound. Eat or drink almost anything that is available, especially crumbs and food scraps. Eggs deposited singly in crevices and behind baseboards; 40 to 170 eggs laid at one stage; egg stage lasts eight to 12 weeks. 1/2 to 1-1/4 inches long; black. Found in pastures, meadows, lawns, occasionally indoors. Eat almost anything but are partial to field crops, especially alfalfa, wheat, oats, rye; will also feed on textiles of cotton, linen, wool and silk. Usually one generation per year, generally hatch in May, become adults in July and August, mate, then die in September. Occasionally break out in massive numbers, with swarms covering many square miles. Light tan to dark brown; 1/2 to 1-1/2 inches long; humpbacked appearance. Found in cool, damp areas, such as under logs or stones, and in crawl spaces, basements and attics; nocturnal. Will eat just about anything; they have been known to feed on clothes and lace curtains. Females lay eggs in spring, which hatch around April; there is only one generation per year. 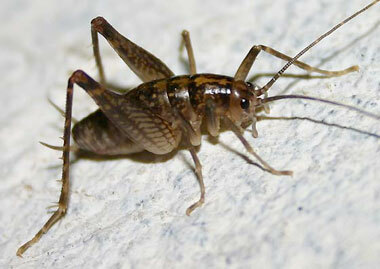 Unlike other crickets, they do not chirp; they become immobile in the presence of strong light. About 1-3/8 inches long; greenish-yellow to dark greenish-brown with yellow midline stripe; forewings blackish-yellow. Found primarily in tall grass and open sandy woods. Female thrusts mass of about 25 eggs one inch or more into soil; nymphs emerge in about a week; they hatch when it rains. 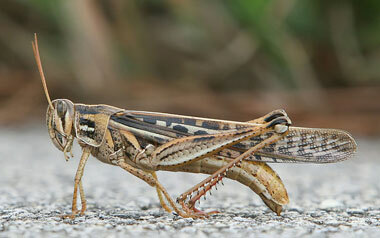 Called “bird grasshoppers” because they can fly rapidly over great distances. Colorless to gray or light brown, ranging from 1/25 to 1/12 inch long. Prefer to live in damp, warm areas; can be found outdoors in grass or leaves, and in areas where molds grow. Microscopic molds and starchy materials such as paste and glues of book bindings and wallpaper. Single female produces between 120 to 456 offspring; lifetime averages 24 to 110 days. Over 100 species in the U.S., with only a few species found indoors; may become abundant and cause damage to books. Adults have wingspread of 5/8 inch; wings are pale gray, with outer portion of forewing reddish-brown; larvae are about 1/2 inch long, with dirty white color. 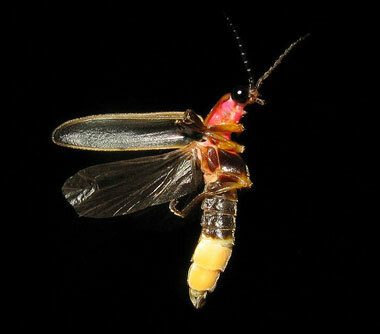 Adults fly mainly at night. Larvae feed on all kinds of grains, flours, and dried fruit. Females lay between 200 to 400 eggs in spring; complete life cycle ranges from four to six weeks. Larvae and adults are often mistaken for clothes moths; adults live only one or two weeks; larvae spin white, silken cocoons where they pupate, and sometimes leave “webbing” behind. Larvae are shiny, white worms about 1/2 inch long; adults have narrow fringed wings, are yellowish-brown and also about 1/2 inch long. Prefer darkness; can disappear quickly if disturbed. Wool and other fabrics, fur; other protein-based materials. Adult females lay up to 200 eggs; larvae reach maturity in 35 days to 2-1/2 years; adults live 15-30 days. Only the larvae feed and are capable of damaging material items. Flattened, with one pair of legs on most of their segments; segments number from 10 to 100; one to 1-1/2 inches long; various colors. Some species live as long as five to six years. Large jaws can bite humans, but the bite is seldom worse than a bee sting. Brownish, one to 1-1/2 inches long; segmented, with a pair of legs per segment. Nocturnal; normally live outdoors under objects located on damp soil; hordes will crawl into homes. Damp and decaying wood and plant matter. Eggs are deposited in the soil; most species reach sexual maturity in the second year, and live several years after that. There are occasions when thousands of millipedes will populate an area, sometimes carpeting the ground with their bodies. Yellowish to brown, with a dark brown violin-shaped dorsal marking; 5/8 to 1/2 inch long. Can be found outside under rocks, leaves, debris, bark, woodpiles, utility boxes; found inside in storage areas such as closets, attics, bedrooms; usually found close to the ground. Cockroaches, crickets and other soft-bodied insects. Mating occurs from Feb. to Oct.; 40 to 50 eggs are deposited in off-white, round silken cases; lifetime averages from one to two years. Bites when disturbed; bites can cause a disfiguring scar. 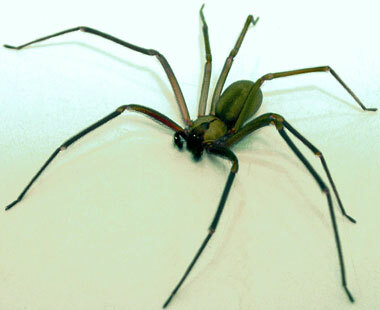 From 1/8 to 1/2 inch long; yellowish to greenishbrown or reddish-brown; four pairs of long, thin legs. Found in open areas on foliage and tree trunks, or on shady walls outside buildings. Small insects and decaying organic matter; plant juices. Females deposit eggs into soil individually; eggs overwinter and hatch in the spring; one generation a year. 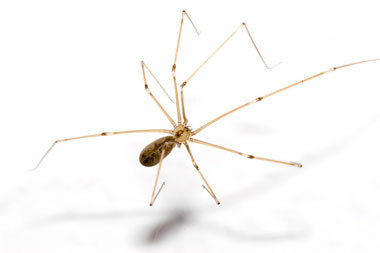 Legs break off easily and cannot be regenerated; if disturbed, they furiously wave second pair of legs in the air. 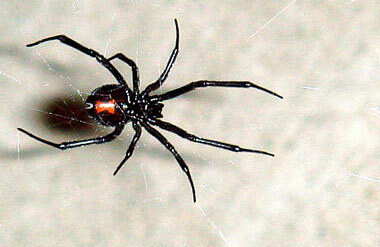 Female is 1/2 inch long; shiny black, with hourglass-shaped red mark on underside of abdomen. Can be found almost anywhere, indoors or out; prefer to build their nests close to the ground. Insects trapped in web made by female. Contrary to popular belief, female is usually unsuccessful in any attempt to eat male after mating; 300 to 400 eggs are laid in silken cocoon, hatch in about ten days. Black widows are not aggressive, and will not bite unless provoked; bites are poisonous, but rarely fatal; if bitten, seek medical attention. 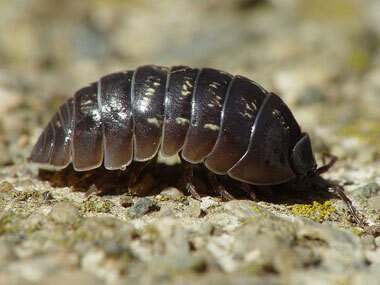 Not more than 3/4 inch long; thorax composed of seven hard overlapping plates with seven pairs of legs; only pillbugs are able to roll up into a ball. Female gives birth to between 24 and 28 young per brood; usually one to three generations a year; may live as long as two years. Pillbugs and related sowbugs are the only crustaceans that have become completely adapted to living their whole life on land. 5/8 inch long, dark reddish-brown, with yellow-brown legs; large forceps (cerci) on the end of the abdomen, which pose no threat to humans. 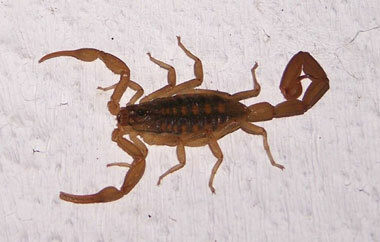 Found all over homes, particularly in cracks and crevices near or on the ground; active primarily at night. Scavengers; will eat just about anything. Up to 60 eggs are laid in burrows in the ground and guarded by the female; hatch in the spring. Many species have a gland which secretes a foul-smelling, yellowish-brown liquid when threatened. About 1/4 inch-1/2 inch long, somewhat “carrot-shaped” from above; gray or silver-colored; three filaments extend from rear. Nocturnal; move swiftly, can jump; found where there is excessive humidity; are attracted to books, wallpaper and other paper products that have a high starch content. Prefer starch, paste, glue; paper products of all kinds; starched textiles. Two to three month reproductive cycle; lay about 50 eggs per batch; live two to 2-1/2 years. Thought to belong to one of the most primitive existing insect orders, more than 400 million years old. Appearance differs by species, but all adults are very small, roundish, with eight legs (larvae or seed ticks have six legs); 1/8 to 1/2 inch long. Live on the bodies of mammals, birds and reptiles. Blood; all species can swell to a considerable size after feeding. 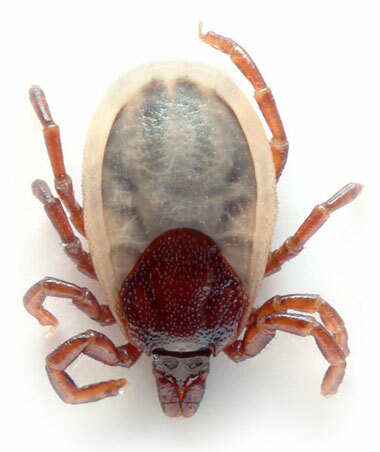 Mating usually occurs while adult ticks are on the host animal; female hard ticks feed only once, and lay one large batch of up to 10,000 eggs; female soft tick will feed several times and lay 20-50 eggs after each meal; eggs hatch in 19 to 60 days. Ticks are known carriers of many serious diseases, including encephalitis, tick paralysis, typhus and Lyme disease; adults can live over 500 days without a meal. 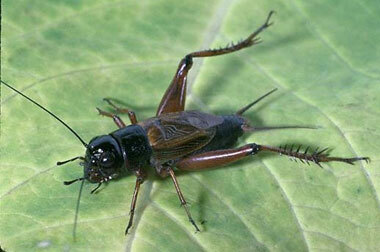 Black to brownish-black, about 1/12 to 1/16 inches long; six legs, with many bristles on body and legs; flattened body. 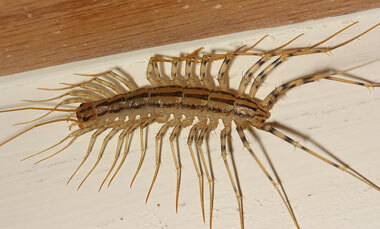 readily attack and feed on humans; can jump as much as 7/8 inch vertically, and 14 to 16 inches horizontally. Female can lay about 25 eggs a day, and up to 800 eggs during her lifetime; fleas undergo complete metamorphosis, usually in 14 to 90 days. 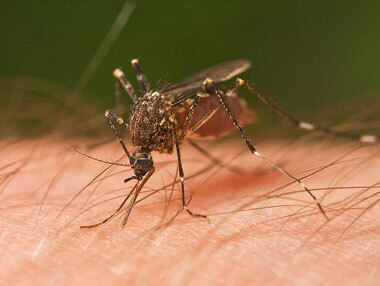 Carrier of many diseases; adults can live one to two months without feeding. Range in size from 1-1/2 to three inches long; eight legs, a pair of large pinchers and a pair of small pinchers near the mouth; tail possesses a stinger. Most active at night; during the day, they hide under bark, logs or stones; in houses, they hide in closets, shoes and folded clothes. Small spiders and soft-bodied insects; will eat other scorpions. Females produce an average of 32 young; young reach maturity in three to four years. Common in southern states; most species deliver a sting no more harmful than a bee’s; very poor eyesight; use pinchers as feelers. 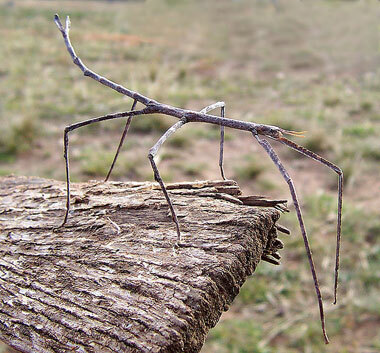 Up to 5-7/8 inches long; almost cylindrical body; nymphs are green, becoming a twig-like brown at maturity. Foliage of grasses and woody plants, especially grapevines, oaks and hazelnuts. Females lay eggs individually; eggs overwinter and hatch in spring; one generation a year. Have the ability to regenerate lost legs; so closely resemble leafless twigs, they are generally overlooked.